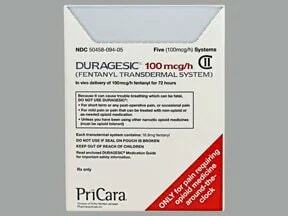 Note: Skin patches that contain the pain reliever fentanyl can be deadly to young children. Who should not take Duragesic Patch, Transdermal 72 Hours? Nausea, vomiting, constipation, lightheadedness, dizziness, drowsiness, or headache may occur. Mild irritation, itching, or redness at the application site may also occur. Some of theseside effects may decrease after you have been using this medication for a while. If any of these effects persist or worsen, tell your doctor or pharmacist promptly. Tell your doctor right away if any of these unlikely but serious side effects occur: mental/mood changes (such as agitation, confusion, hallucinations), severe stomach/abdominal pain, difficulty urinating, slow/fast/pounding heartbeat, signs of your adrenal glands not working well (such as loss of appetite, unusual tiredness, weight loss). 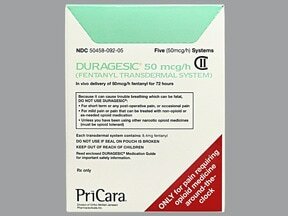 List Duragesic Patch, Transdermal 72 Hours side effects by likelihood and severity. 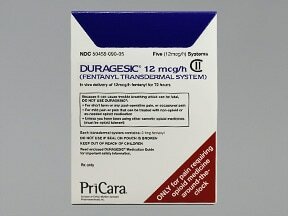 Before using this medication, tell your doctor or pharmacist your medical history, especially of: brain disorders (such as head injury, tumor, seizures), breathing problems (such as asthma, sleep apnea, chronic obstructive pulmonary disease-COPD), kidney disease, liver disease, mental/mood disorders (such as confusion, depression), personal or family history of a substance use disorder (such as overuse of or addiction to drugs/alcohol), stomach/intestinal problems (such as blockage, constipation, diarrhea due to infection, paralytic ileus), difficulty urinating (such as due to enlarged prostate), disease of the pancreas (pancreatitis), gallbladder disease, slow/fast/irregular heartbeat. 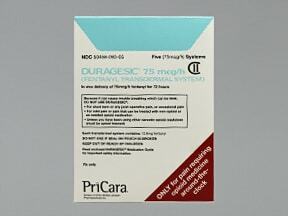 Does Duragesic Patch, Transdermal 72 Hours interact with other medications? Do not flush medications down the toilet or pour them into a drain unless instructed to do so. Properly discard this product when it is expired or no longer needed (see also How to Use section). Read the Medication Guide for details. In the US, the FDA recommends flushing this medication down the toilet. Consult your pharmacist or local waste disposal company.Information last revised July 2017. Copyright(c) 2017 First Databank, Inc.
Are you taking Duragesic Patch, Transdermal 72 Hours? 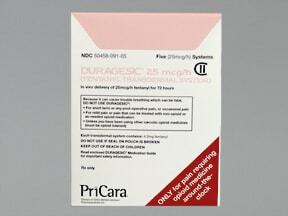 Are you considering switching to Duragesic Patch, Transdermal 72 Hours? How long have you been taking Duragesic Patch, Transdermal 72 Hours?